The LH (Luteinizing Hormone) which is in the urine of normal women willincrease dramatically in the middle of the menstrual cycle. The LH increasetriggers ovulation which is when the egg is released periodically from Normalfertile women. WHO experts state that LH testing is a reliable way to detectovulation. Ovulation will occur after 24-48 hours following a positive test.One Step Ovulation Urine Test is a qualitative test used to predict when thereis a LH surge, and in turn, when you are likely to ovulate. LH Progress Card helps TTC women estimate the LH level in theurine and record the result on the log to show the progression of LH level inurine. NOTE: The IDEAL time for ovluation test is in the afternoon,though testing may safely take place from 10am to early evening. Detects the presence of human chorionicgonadotropin (HCG), which appears in urine very early in pregnancy. Regardlessof the technical language, this test works just like most other pregnancy testsout there. It measures the levels of the pregnancy hormone human chorionicgonadotropin (HCG) in your urine. This hormone is produced by the cells of theembryo that will later form the placenta. The level of HCG starts to increasefrom its basal level of less than 5 mIU/mL directly after implantation, and doublesabout each 48 hours during the first weeks of pregnancy. ✔ WHAT'S NEW? 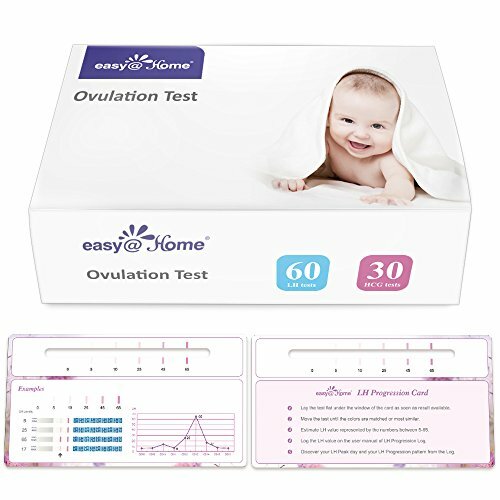 Unique LH Progression Card and Log designed by fertility specialists with evidence-based user data, with great value added to the the popular Easy@Home Ovulation Predictor Kit (OPK) consists of 60 Ovulation Test and 30 Pregnancy Test Strips. ✔ WHY PROGRESS CARD AND LOG? Most patterns will show a light to dark to light test line progression in the few days before ovulation. Some women may have less predictable progressions than others due to a lot of reasons. The most common issue is you may not easily pinpoint the peak time with only ovulation tests tracking. No matter what type you have, the kit offer you the easiest way to help you do self prediction naturally with minimal intervention by other parties. ✔ WHAT'S THE UNIQUE BENEFIT? The new LH monitor kit will help you easily figure out you have normal ovulatory pattern or any potential infertility issues such as PCOS, LUFS, Ovulation dysfunction. So you are confident to get pregnant sooner. ✔ SPECIALLY DESIGNED FOR "TRYING TO CONCEIVE" WOMEN: Ovulation tests gives woman greater chance of predicting their most fertile days, even if their cycle lengths are variable; Pregnancy tests tells pregnancy sooner than missed period. ✔ 100% CUSTOMER SATISFACTION GUARANTEED: OPK test kit is approved by FDA for OTC use and Results are 99% accurate; Experienced and professional customer service are available for any questions coming up.